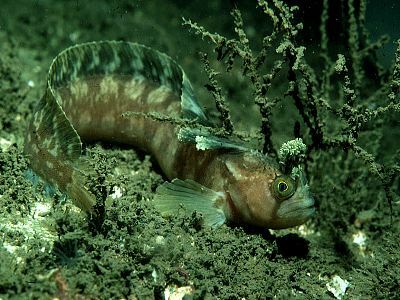 Description: Yarrell's blenny has a long, slender body and two pairs of branched head tentacles above the eyes. The dorsal fin is of uniform height and runs the length of the body. The first few rays of the dorsal fin are branched, especially in older males. Adult fish are mostly between 10-15cm in length but may be up to 25cm. The coloration is usually pale yellowish-brown with darker mottling and patches. There is a ring of dark pigment around each eye and also a dark bar extending from beneath each eye towards the sides of the mouth. Habitat: This species is usually found hiding in crevices in rock or on wrecks at depths between 20-30m. It feeds mainly on small molluscs, crustaceans and worms. Distribution: Occurs at scattered localities all around the coasts of Britain and Ireland. Similar Species: Yarrell's blenny is easily identified as it is the only species to have two pairs of branched tentacles above the eyes. Picton, B.E. & Morrow, C.C. (2016). Chirolophis ascanii (Walbaum, 1792). [In] Encyclopedia of Marine Life of Britain and Ireland.